The 16th was part of Wellington's Peninsula Army 1809 - 14, winning major battle honours at Talavera, Salamanca and Vittoria. In 1815 they fought in the final defeat of Napoleon at Waterloo, in Belgium. The ensign is highly speculative, but only included because the Front Rank battalion pack includes one. Overall I love the quality of the Fronk Rank miniatures, but the lack of variety in the posing is less pleasing. Still at under £2.40 a piece for metal cavalry, they aren't bad. The chest lace should perhaps only be silver for officers, but the effect is nice so I doubt I'll change it. 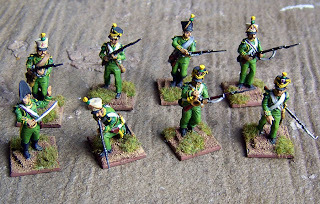 They were fairly quick to paint, and so I had time to start another little side project, some more French troops for our skirmish games. Lovely vivid green uniforms. These are all portrayed as voltiguers, including an officer and a bugler. Made from a variety of spare victrix figures, including at least three officer and a drummer torso! Nevertheless, officially I am behind my purchasing now, which is lamentable! And the bad news will keep coming I'm sure, as tomorrow is Fiasco, and the likelihood of me visiting a wargames show and not buying some models is pretty slight. Battlefield Evolution WW2 - Any good? 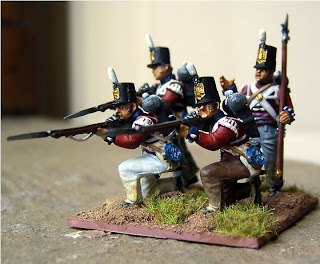 As promised, my thoughts on these, having now played them; along with a little battle report. Firstly the basics. Troops operate as squads, vehicles as individuals unless attached directly to a squad (e.g. transport). It's IgoUgo, except that enemy forces within engagement zones (10 inches generally) of your units have the option of a reaction, to interrupt - either with fire or movement. A unit can take two actions per turn, of which there are four; Fire, Move, Assault or 'Ready'. Ready actions generally combine two actions in to one and allow more complex things to be done, such as vehicles moving and firing at any point in their movement. 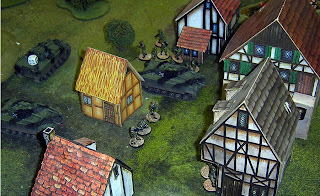 We set up a game of 1500 points, which on table was equivalent to a platoon sized action with a healthy amount of support equipment. 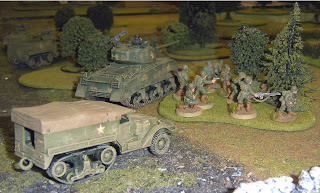 My American Armoured Infantry faced Steve's Waffen SS (boo hiss!). Steve took first turn at my decision, a nice element of the game is that players elect in secret at the start of the game whether they are on aggressive, defensive or reconnaissance (called Probe)orders. Both sides could pick the same, which is nice, the result of this choice gives each player different orders and victory conditions. I'd elected to probe Steve defenses; though it seemed Steve decided attack was the best form of defense. Mortar fire caused early casualties for both of us; apparently on this occasion our artillery was very accurate, but based on the system established for it, it is hard to see how it wouldn't be. 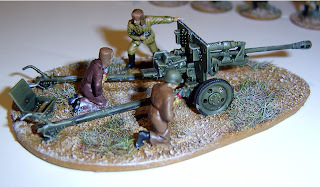 With 20mm models it wouldn't be so bad, but for a cluttered 28mm scaled setup it was hard to miss with artillery. The firer nominates his target point, and if he has no line of sight, the opponent nominates a direction of deviation and rolls a D10. That is the number of inches off target the shot lands, but then the firer rolls a D10 too to move the shot back on target. 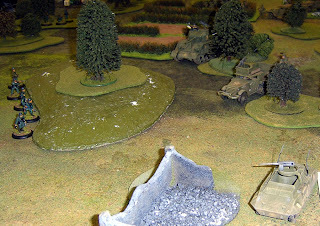 On average it moved the target point by one and a half inches in our game, and with a blast area of three inches, seldom did less than hit half a target unit. Armour was very similar to a lot of other games in some respects, but was handled generally well enough, and I've no complaints about it. 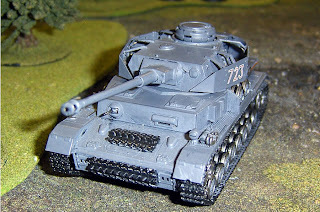 Tanks are properly effective at this scale, but my Bazooka teams were entirely luckless on their firing rolls and Steve's Panzer IV was only worried when my Sherman 76 paid it some attention. Morale as such, is handled in a simple fashion, a unit with its commander alive can always act normally. But as commanders have no special immunity to getting killed, unlike say, any game of Warhammer you've ever played, this is unlikely to stay as the situation long. A unit of half strength or more can always elect a new leader, once under half strength, and leaderless a unit can only react to enemy activity, and does not take actions in its own turn. Routing doesn't happen, but it reflects troops becoming pinned, but with the option to defend themselves or withdraw when their immediate situation becomes threatened well enough. 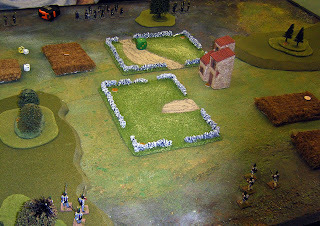 On table the Americans were boxed in and suffered a pasting, one point that bothered me was the definition of certain weapons. Machine guns only fired three shots, far too few in my opinion at this scale, compared to how effective artillery was. Cost them more and make them at least twice as effective I think! Meanwhile a German 37mm gun was credited with a HE round; doubtful. So in general, they are pretty good, if needing a little common sense applying here and there. 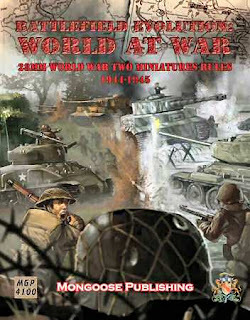 The rulebook seemed clear and simple and well priced at £15; it contained reasonably complete army lists for at least four major combatants in the late war period - Germany, Russia, America and Britain, and was extensively illustrated. Well worth a look, and I think I'll try a few more games for sure. A mixed bag of painting this week. Starting with the first command figure for my British. General Cameron, one of Wellesley's first brigade commanders in the Peninsular. 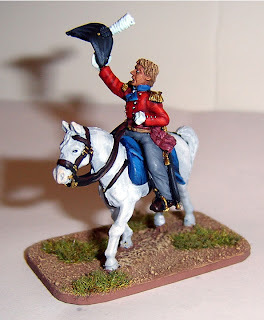 A Front Rank officer miniature, crisp sculpting and a breeze to paint. I went for the classic white horse, and was pleased with the result; as well as that of his scarlet coat and his hair. Little touches that make the model look nice. 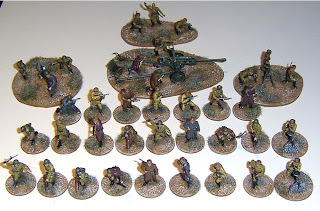 Other than him I've finished another batch of WW2 for eBay. This time a late war Russian Battalion with added Divisional artillery support; i.e. one 76.2mm Zis 3 gun. 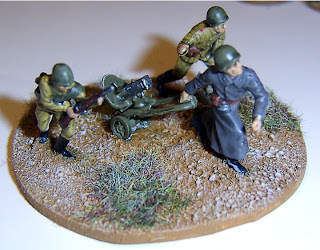 Most of the figures are Italieri's rather static, but easy to paint Russians, one advantage of their most recent models is the very resilient plastic they use, almost as stiff as metal! However as a result the releasing agent to get the models out of the molds is particularly nasty. Paint will not adhere to them! You must either wash the models in hot soapy water or spray undercoat them; preferably both. I undercoated white, which worked well with thin coats of the main clothing shades, and the usual black wash varnish to finish. The gun is also Italieri and is a fantastic model. Excellently detailed and with some really lively crew models, along with the more usual loading poses. The officer shouting and pointing is lively, and the ammo carrying figure (converted below to lugging a maxim machine gun) is perfectly done. Whilst it may not take paint well, this material accepts superglue well enough. I tried a wintery theme on the bases, though not wanting to go for all out snow. Having lived in the Alps I know what snow looks like and most wargame snow bases do not look like snow! I opted instead for a simple hard morning frost, to imply the a bitterly cold Polish or German dawn. Or in other words, give the bases a normal treatment, and then dry brush them white. Remembering to give the same attention to large metal equipment, which will tend to attract frost too. If you are really showing off a dry brush of a gloss or pearlescent varnish would add to the effect. Or 'Hamburger Hill' as Neil termed it. High atop a ridge stood the Casa del Santa Rodriguez. Both sides needed to secure the high ground to outflank the enemy in the upcoming battle. 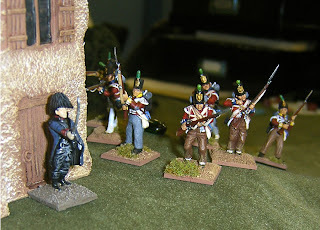 Blunt found himself against a highly professional cadre for French Light Infantry, but lumbered himself with the 'Scum of the Earth' mere line infantry. Would he be able to act in time with a handful of Chosen men to stop the French? 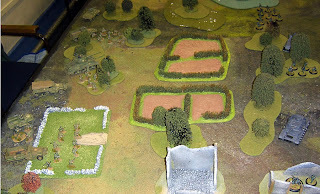 The intention of the scenario was to throw another curve ball into the simple condition of seizing the house to win the game, the size of the hill meant that both sides used counters to represent the movement of their units until such a time as units crested the hill and could see one another. This way we could not be sure what the opponent had or where. As it was my riflemen won the race to the top of the hill and spotted the enemy commander first, as it turned out leading elite Leger up the hill behind him. He made a dash for the house, whilst the troops behind him withdrew from deadly rifle fire. Unbeknown to him though , British light troops were just arriving at the rear of the house! 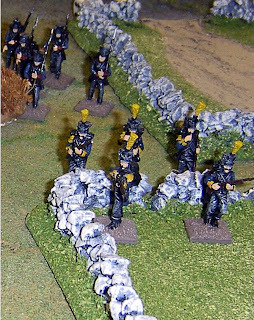 Fortunately, in doing so, other French Leger spotted them and were able to drive them off with musketry. In their stead a platoon of the line moved to the crest of the hill. 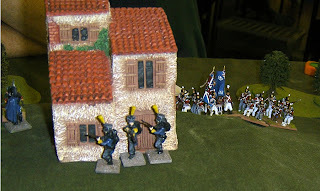 Unfazed, the French charged and forced them to withdraw too. But they rallied and unleashed a massed volley up the hill, which whilst not very accurate, did enough in volume to force their withdrawal too. Under the cover of this Blunt advanced on the house, unaware the French commander was already there. The Frenchman leaped from a first floor window, sword in hand; and landed in a heap in front of Blunt. Blunt struck him a devastating blow, but some how the Frenchman rose to his feet, and so a long duel began, both drawing further blood. Elsewhere a steady exchange of fire continued as both sides tried to reach the top of the hill in force. The Leger succeeded, getting a handful of men into the building whilst the British dithered below it. However many of their number had been diverted by a pair of riflemen giving enfilading fire from a nearby copse. Suddenly melees were breaking out left and right. 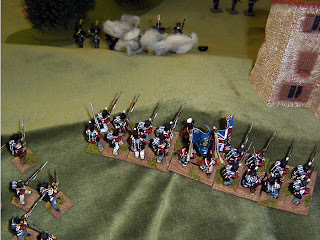 But as time ran out the French commander finally buckled and withdrew, wounded too many times. Blunt looked at the prize of the house, he could feel its warm hard walls, but he had no comfort in the thought of support. His Chosen men were being outnumbered and driven off, whilst the Line infantry stood impassive halfway up the hill. What a great game, back and forth, with plenty of uncertainty and lots of tactics. In the end we agreed it a draw. As to the rules, well they are on the last revision now, and really I only need to add a clarification appendix and some more notes to the points system and they will be published via the blog. And a game of Battlefield Evolution; by Mongoose Publishing. Ultra modern at a platoon/company scale, played around some classic Warhammer card buildings belonging to Mark. By eck, they still look the business! 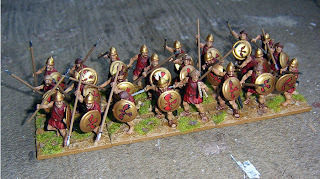 The Ongoing saga of my Wargames Factory Numidians transforming into Greeks. 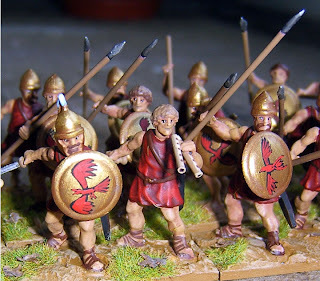 There was no need to convert these models as such, it was simply a case of using a lot more of the helmeted heads and providing new, larger spears. I do my Hoplite spears about eight or nine feet long in scale, not like those who seem to think they already carried a pike of 12 or more feet in length. The Musician was built by simply cutting the bow out of a spare left arm and making a set of Greek flutes - two bits of plastic rod, joined at an angle. Historically they were often shown using a mouth strap to position the instrument, but for the sake of simplicity I've ignored that. The shield design of a red bird is identified with Chalkis, in the Thracian colonies, and so suited the theme of my Spartan Army of Brasidas. I allows them to stand as allies or foes to my army. 24 figures built and painted in about four days. For an effective cost of about 60p each. Ah, Python. 40 years old, and still some good gags. I bring this up as it relates to a King showing his rather dim son the terrain he will one day be master of, as this article kinda does too. Ahem. 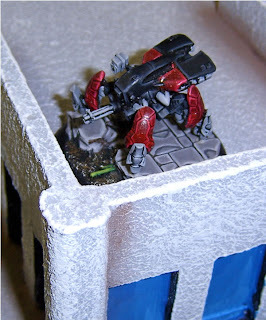 Anyway, rummaging about in the club terrain boxes can at times be a disheartening experience. Amongst the innumerable 40k 'Gothic Ruins and ugly foam hills there is a lack of variety or well made pieces that would stand up to the general abuse of cramped storage boxes and regular usage. Still, there was no point moaning about it and doing nothing. 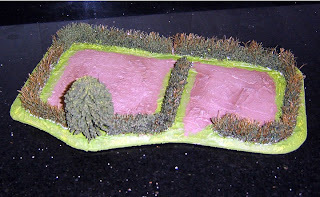 I used to make all my own terrain, barring the odd nice, bought piece. A quick word and a quick rummage in the bottom of the boxes and I had a bagful of sad looking remnants to work with. 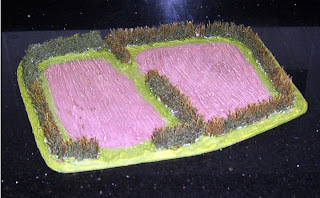 The fields rescue a dozen or so sections of hedgerow (the sort railway shops sell for £1 each and GW sell for around twice the price) by fixing them to a cheap base of hardboard coated in wall filler. I played around with the surfaces on the two and though the latter looks nicer, its' ploughed effect is not so likely to withstand careless use, still by fixing the terrain to a sturdy wooden footprint, it should survive storage and make for an attractive centre piece to a battlefield. 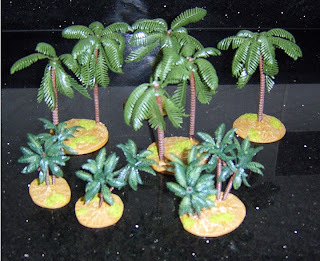 I also rooted into a supply of plastic palm trees which had regularly been appearing in Flames of War games stood around on large white plastic bases. What an eyesore! Nothing more filler some tester pot paint, a drybrush of acrylic and some scatter cant fix! Not having to buy the terrain itself meant I just dipped into my pocket for a couple of quid for the hardboard. Though attempting to cut this stuff with just a craft knife is setting yourself up to pay in a different way, a small saw would have helped no end! In general the quality of scenery at our club is improving, as is the storage (better sized and tougher boxes which stop overloading); and I'm pleased to note I'm not the only member contributing quality scenery, a pile of attractive near future buildings having recently appeared. 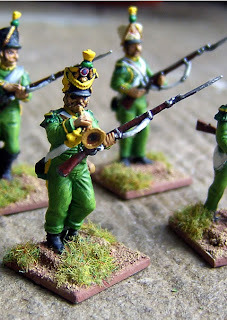 Well, there is a swing in my club towards these as a set of playable rules for Napoleonics, and so I picked up a copy. Despite a hefty page count of 223 pages I managed to read through them over the week and with the caveat that I haven't actually played them as yet, I can offer a few thoughts. Presentation: High production values still can't hide a fistful of minor typos. 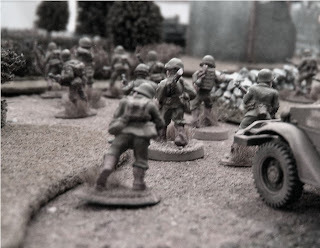 Ordinarily in a book these wouldn't be more than mildly diverting; but in wargame rules a point that is stated once as one set of values, and later repeated with different values is the chink in the armour that beardy players use to dig in and exploit a game. Similarly an obvious error in writing that clearly contradicts the intention of the rules will allow the 'Rules as Written' crowd to exploit an advantage. There is little of this in the book, but it shouldn't have been there at all. I spotted it on one reading in a week; did they not have time in their production schedule to put in a week for proof reading then? Another point is that any close inspection of the photographs will show that there were actually little more than a handful of display setups of games made for photography. All the images of sample units in the army lists are photoshopped, and virtually none of the bases shown appear to exist in reality. In the group shots, 90% of the figures are based to different conventions than those recommended in the rules. So that is clearly an area of complete irrelevance to play! Rules: You might think I'd start here, but I'd be surprised if unlike me you didn't spend your first hour just pouring through the book; taking in the above. The rules themselves are short, simple and elegant, relying on a command card system, once forces close to a range where they could charge each other, to control the battle. 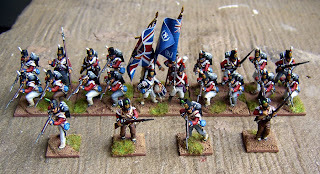 It has to be said that one initial concern is that it seems likely that units will often fail command rolls, which are they key governor of action, and so stand around doing nothing an awful lot; regional commanders influence is limited, and unless you are French or blessed with good commanders your chances of operating will hover around the 50/50 mark when in range of the enemy. Not having seen this in action I may be unduly concerned, but the math suggests a possible excess of randomness here. Another displeasing randomness is the rolling for Generals abilities at the start of the game. This means you could find your command system blessed with geniuses or hamstrung by halfwits. There is no point system to allow for buying generals of a given talent; which I would have preferred so you are stuck with this as it stands. Knowing my luck the dice will favour me with the occupants of St. Dunstan's school for the In-bred Nobility whenever my British take the field. That aside the forces move freely outside of contact, but once in the 'engagement range' it is down to the cards; offering a variety of expected aggressive and defensive options. The Firing and combat is all d6's and much what you'd expect, though some of the ranges seem longer than rules like this typically go for, they are not unreasonable, (IIRC) muskets fire up to 15 inches for example. What is nice however is that there is no casualty removal. I approve of this. 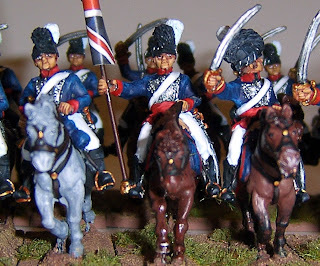 If you look at casualty rates in smaller general engagements, where one regiment can be seen to act upon another, fatalities and wounds from battle are never as bloody as most wargames rules would imply. However the morale effect of attritional loses is seldom handled well. 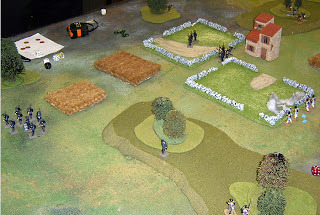 In both these aspects it looks to me like the rules get things right; units at least appear at full strength until destroyed; which will almost always be as a result of routing from the table, and the effect of casualties on the morale of the unit is to my mind believable - there will always come a point where no matter how good the unit, it's position on the battlefield will become untenable. Rules for terrain, weather, skirmishers, engineers and so on are included, but none of this causes the rules to stretch much beyond 80 generally well laid out and clearly explained pages. Scale: Obviously intended for 28mm, the only games in action I've seen have been played in 15mm by halving all the stated sizes. 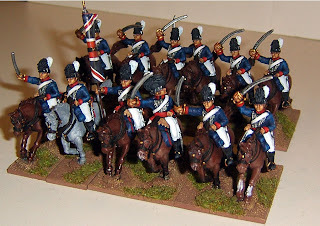 Units are notionally formed of six bases of 4 figures for foot troops, on 40x40mm bases. Now this matches almost no-ones established collections, though it is becoming more of a standard with newer collectors. I must point out that the stated unit sizes are, due to the game mechanics, almost totally irrelevant. You have the same game with units of four bases of 6 figures as with 6 of 4. You have the same game if one side is on 60x20mm and the other on 45x40mm. So long as the number of figures in the unit is roughly the 24 suggested, and the footprint of similar units in armies are about the same, the game will play as intended. You can virtually ignore their recommendations, as I said in most of their own photo's it's obvious they would. Incidentally the game is written with 4 feet wide tables in mind, This allows little space for manoeuvre, but a 5 or 6 foot wide table with both sides starting further apart would easily remedy this. This is where the fact that the rules are specifically supporting Foundry's own range of models becomes abundantly clear. If they don't make models for it they haven't included it in the rules. That is highly annoying, but in this day and age unsurprising. Hopefully they'll have the decency to release a supplemental set at some point; otherwise enthusiasts will soon clutter the net with amendments and additions. Background and supporting detail: Mainly as part of the army lists there is a fair deal of supporting material; the rules will serve as a good uniform guide for the basics of the covered forces; and history of the campaigns are given in brief. Still it can only be little more than an introduction. There are two painting guides, one is the super detail option few of us can expect to achieve for more than a couple of models a month, and is just as much a huge plug for the Foundry paint range, the other is full of good practical advice for getting units churned out effectively, if not so prettily. I think the latter is the more useful. So overall. There is a lot to like, but it could have benefited from a little more time and a little less of an 'in-house production feel'. 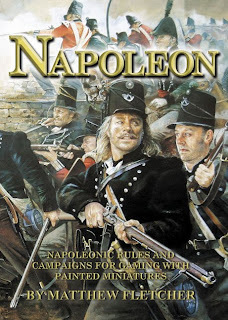 With Black Powder on the horizon and no shortage of established rules out there with their own adherents, you have to wonder if Napoleon will be a long term success. But in the rules themselves, I think, and I cannot confirm it yet, that Matthew Fletcher has come up with the goods, neither off-puttingly complex, nor childishly simple. 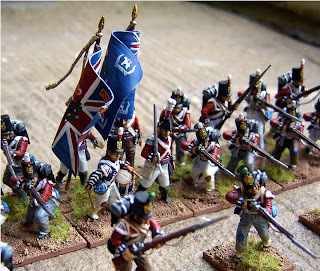 After a long break, me and Neil got the Napoleonics out again for another little skirmish, in the ongoing tale of Lt Blunt of the 60th Loyal Americans and his battle against the French. The scenario this time was a simple one, and I decided to avoid formed units, as they wouldn’t really have made sense. This would be an easy one and to be fair a oft attempted one to replicate. Blunt found himself with three small sections of men, scavenging a farm for treasure lost in an earlier battle; against him was fencing master Louis Pappilon with around twenty men. According to the scenario we each placed treasure markers, without knowing their value (from 1 to 5) across the board, no marker being allowed to be less than 6 inches from any other; ten all told. Initial dispositions, Blunt and his Chosen Men are off camera, stage right. 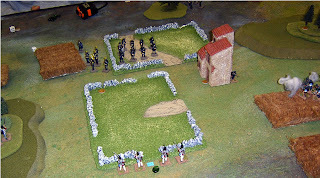 Using the latest modification of my skirmish rules the two sides manoeuvred towards one another, the rules now present the possibility that the commander (as in DBA) will have less commands than units in a turn; however personalities are now more characterised, Lt Blunt for example was ‘Rugged’; he could take two wounds! An addition of a quick play sheet to the rules sped things up no end despite some additions to the turn sequence. Anyway, both sides advanced on one another and started grabbing treasure. The units had to hold onto it to the end of the game or leave the board bearing it for it to be worth anything. As it was the only person to lose treasure was my, when Lt Blunt charged the enemy only to be wounded, in his retreat he dumped his booty. 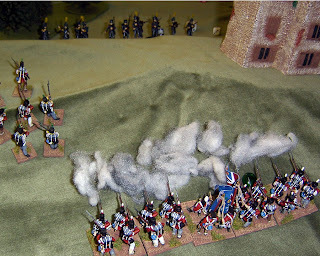 The untidy melee in the centre saw the French try to eliminate Blunt whilst being shot up from all directions. On my left Louis Pappilon fenced his was through a unit of light infantry, though their last survivor managed to escape with his gold. I began to withdraw, whilst the French hoovered up the remaining treasure, as they had six markers to my one, I assumed I’d lost, but it turned out I’d bagged most of the high value ones, and so won by a single point. 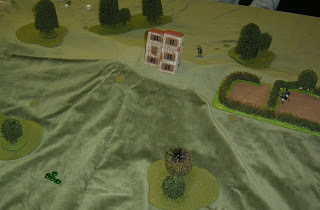 A great fun little game, which saw only five models removed from play, and a handful of wounds inflicted. The scenario played out well and, barring a few small tweaks still to make, the rules work well. All in all, most satisfying, though Blunts’ reputation was somewhat tarnished by his poor judgement in charging the enemy. Arthur Cotterell has an awful lot of interesting material in his book on the ‘rise and fall of the worlds first war machine’. Perhaps as a consequence, it often feels incoherent, and there are frequent situations where he seems to favour mythology over archaeological evidence or historical records. 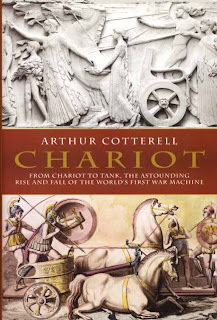 The book looks at the broad sweep of use of the chariot, focusing on four main areas, the near east, India, China and Asia Minor. The problem is that Cotterell’s evidence is frequently drawn from limited or mythologized sources, which he relies on too much. Also he has fixed in his mind his own clear timeline, which means he has to dismiss the use of Chariots for practical military action once cavalry are introduced. He instead reduces it to ceremonial and sporting use. This despite the fact that Chariots were active weapons of war in Celtic Europe for centuries after that date, despite the fact that the chariot was still used in great numbers, if not as the elite super weapon of days past, in the near east for a good 600 years after the introduction of horsemen. It is also clear, despite his excellent points on the use of chariot archery, that Arthur is not a specialist in military history; for example he doesn’t appear to know about box saddles and therefore can’t conceive of effective heavy cavalry until the introduction of stirrups; so never mind what the Sarmatians were doing for example. Also he dismisses the idea of chariots as mobile transport, yet we know Julius Caesar himself fought against chariots used in just this way to great effect. There are other points too. But perhaps the biggest problem is the scattergun approach of writing. Poor old Arthur has so much interesting material that he cannot seem to keep his mind on one topic for very long. Is the obsession with physical perfection in Indian kings really relevant to chariot warfare? Failing that you suddenly find yourself in the midst of another subject, probably mythical, when the paragraph started by discussion arrow heads. This is a harsh review, because as a book on military history, 'Chariot' fails. Nonetheless, there is some interesting material here, but it is not nearly as revealing as I would have hoped. 24 figures as is standard for my British battalions. A pleasing variety of trousers here, some patches and weathering too. The base coat for my flesh was much darker than normal, and I thought I'd cocked it up; but the finish quite suits these models, with their gurning Victrix faces. However a few of the models have Perry heads, and even arm sets to increase the variety. So hear is the army shot to date; not bad considering there were none of them in June. 102 figures so far, it's about one third of my envisioned army. 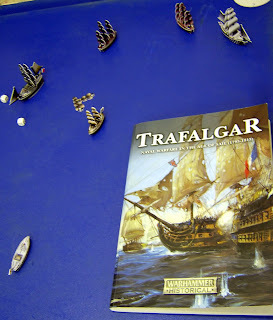 Really, I must be letting every one of my countrymen down as a result of this, I lost a game of Trafalgar, with the British, against the French; the French! Ok, maybe overstating it a bit; though several members of the club told my opponent to go home and think very seriously about what he had done. The average British gamer will it seems accept the defeat of his or her majesty’s armies, but the Navy is somehow sacrosanct. To put it to the sword, especially with the traditional enemy is a step too far. But you can’t argue with results. I set up both fleets to be even handed 500 point forces, no dodgy choices (hot ammunition and so forth), just a single ship of the line each, a pair of frigates and one or two unrated vessels. So the blame is not on any abuse of the rules. My deployment at the start left me sailing away from the enemy at first, hoping to bait him in to splitting his fleet, but instead ensured I split my own. My mistake for sure. But then when I got a little opportunity, thanks to the wind changing, the dice intervened to ensure even my most perfectly placed broadsides bounced harmlessly off the enemy ships. 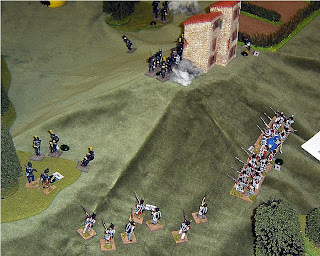 The French held the tactical high ground throughout most of the game, although forced to withdraw one ship due to the wind (i.e. 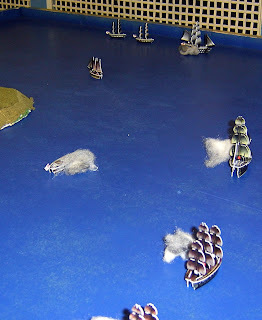 it fell off the edge of the ‘world’, it sailed off the table); and having their flagship ‘in irons’ for two turns, they managed to destroy the British fleet piecemeal, sinking two vessels outright and leaving two others, including the HMS London, my flagship, as hulks. Only one frigate managed to escape. As ever the models used were the ‘Pirates’ card models. The nicely painted blue board is a recent club innovation; a common sense solution, simply paint the underside of a normal board blue.